Suppose f and g are inverse functions. What is the relationship between their derivatives? 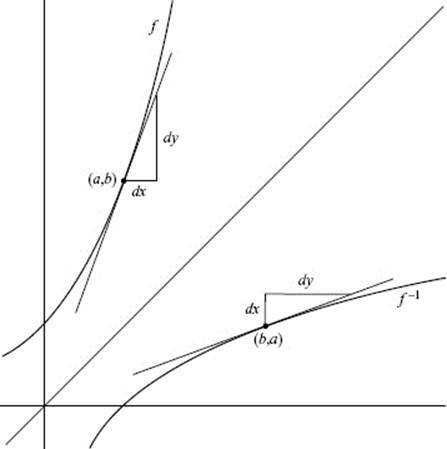 Recall that the graphs of inverse functions are the reflections of each other in the line y = x, and that at corresponding points their x- and y-coordinates are interchanged. Simply put, the derivative of the inverse of a function at a point is the reciprocal of the derivative of the function at the corresponding point. If f (3) = 8 and f ′(3) = 5, what do we know about f −1? SOLUTION: Since f passes through the point (3,8), f −1 must pass through the point (8,3). Furthermore, since the graph of f has slope 5 at (3,8), the graph of f −1 must have slope at (8,3). A function f and its derivative take on the values shown in the table. If g is the inverse of f, find g ′(6). SOLUTION: To find the slope of g at the point where x = 6, we must look at the point on f where y = 6, namely, (2,6). Since f ′(2) = g ′(6) = 3. Let y = f (x) = x3 + x − 2, and let g be the inverse function. Evaluate g ′(0). Where is the tangent to the curve 4x2 + 9y2 = 36 vertical? SOLUTION: We differentiate the equation implicitly to get so Since the tangent line to a curve is vertical when we conclude that must equal zero; that is, y must equal zero. When we substitute y = 0 in the original equation, we get x = ±3. The points (±3,0) are the ends of the major axis of the ellipse, where the tangents are indeed vertical.